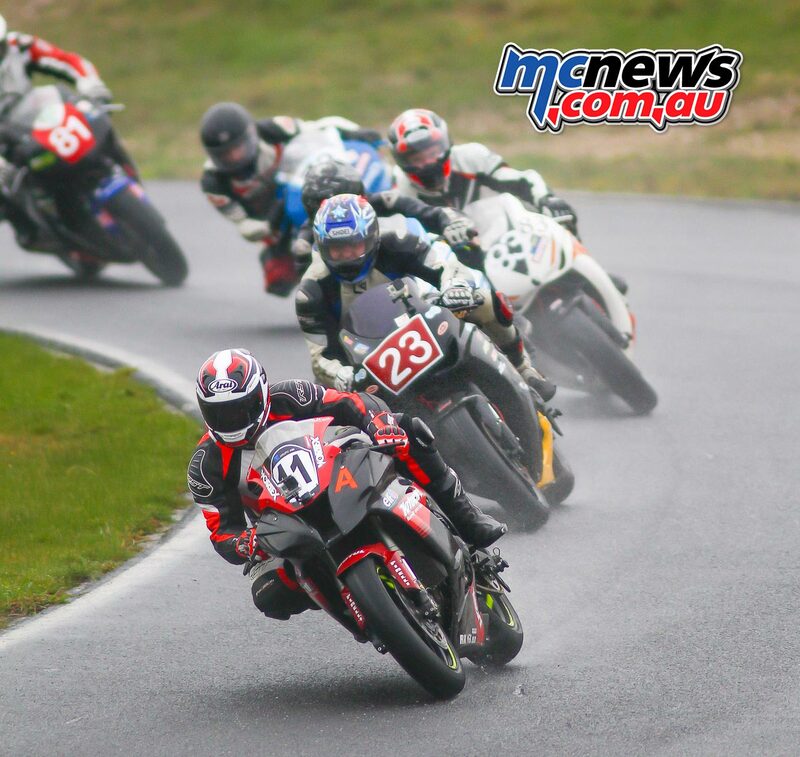 Cold, wet miserable weather tried it’s best to dampen the 4th round of the Hartwell Motorcycle Club Championship held at Broadford State Motorcycle Complex, but with nearly 100 entries and 46 races to get through, there wasn’t time to lament about the weather. 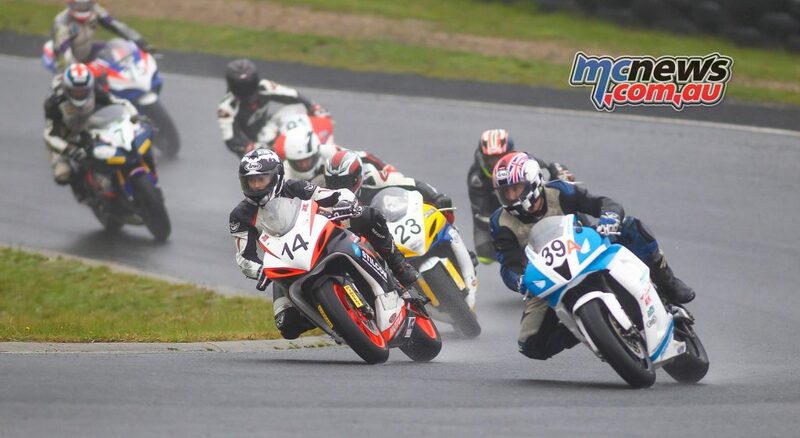 The riders all took it in their stride and made the best of the very difficult conditions, which varied from constant rain to a drying track at the end of Sunday’s racing. The changing conditions making tyre choices a challenge with most opting to stay on full wets and put up with the tyre degradation as a result. The total number of entries was effected somewhat by a few factors. The first being the proximity of the previous round, being only 3 weeks prior. Also, having a national round in South Australia the previous weekend meant some of the usual South Australian riders who race in the series had decided to do their home national round rather than the Hartwell round. 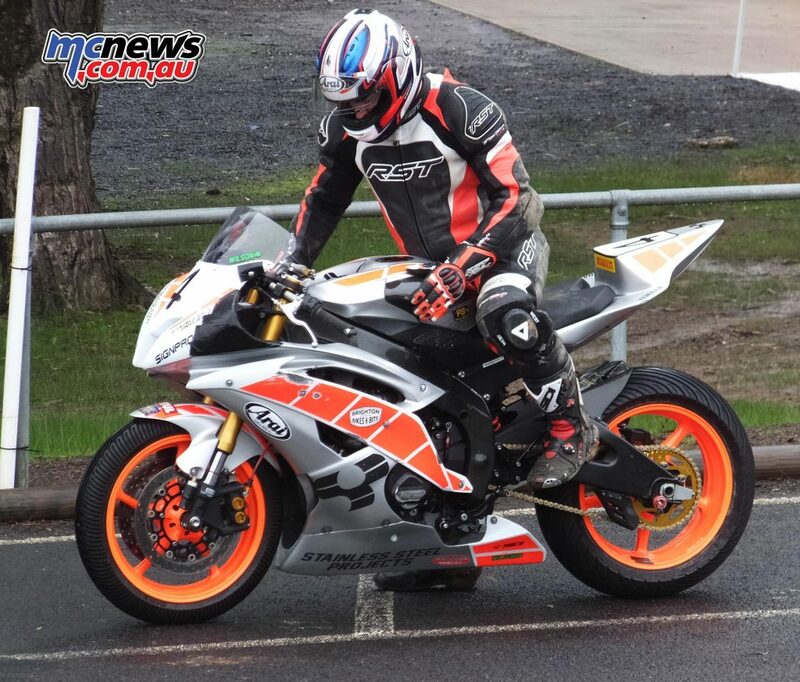 In addition to this, the Australian Superbike Series being run in Perth W.A. that very same weekend had taken many of the big name Hartwell members, such as Ted Collins, Ben Blyth, Nick Liminton and Tayla Ralph, west to continue their assault on the national series. There were still some big names and some very familiar old hands such as Chris Ognenis, Graeme Koschmann, Brian Bezzina, Andrew Ord and Mark Lamont. There was also a good number of juniors including the usual suspects being Peter Nerlich and Scott Nicholson who again ran triple duties, racing not only his junior bike, but also his RS125 Gp bike and his 300 production bike. The meeting was also tinged with sadness with the Hartwell Motorcycle Club member Dwight Beare losing his life on Saturday night in a sidecar accident while competing at the Isle Of Man TT. Sunday morning a minutes silence was held in honour of Dwight and the contingent of sidecars decided not to race. 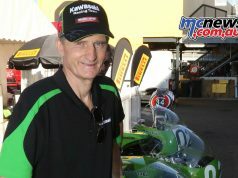 This decision was understandable with the sidecar community being so close and many riders and passengers knowing Dwight very well, one could understand their grief and not racing was probably a prudent decision, not only out of respect for Dwight, but also in the interests of being able to maintain focus out on the racetrack. With 46 races to be held over numerous classes, it was a hectic weekend for officials, riders and all the ancillary staff who assisted in running the race meeting. 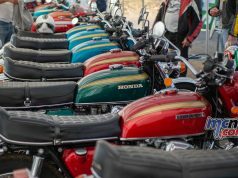 On Sunday I sat down with club president Glenn Nankervis during the lunch break to chat about the Hartwell Motorcycle Club and some of their current activities and plans for the future. Hartwell is one of the oldest (est 1931) and one of the largest clubs in Australia. Certainly in terms of road racing it is probably the oldest and the biggest. It’s also well known for running meetings which are held at the highest of standards and are often the benchmark for other clubs to follow. Glenn took over as president around 2012 (He couldn’t quite remember himself….i’d say it’s been a hectic few years for him). While this meeting had less entries due to other racing and the proximity of the previous round, I asked Glenn what he thought was a contributor to the lower entry numbers in general. I remember Hartwell meetings of the past attracting entry numbers as large as 220, especially at Phillip Island, where as currently an entry list of 130 is the norm. “There are probably many contributing factors, but two of the main ones are the loss of the Stars of tomorrow meeting in October. This was a huge drawcard with new up and coming riders having the chance to get on factory machinery and show off their abilities on top level equipment. With the national season normally done and dusted by this time, it was a great opportunity for the factories to look for new talent. However, the loss of the date to car racing at Phillip Island put pay to that. Another factor was the Global Financial Crisis. Motor racing has never been a cheap sport and the GFC had a large effect on people, with less disposable income to spare for racing. However, our numbers of entries have been climbing back up again steadily year by year and we are confident of achieving increased entry numbers moving forward. 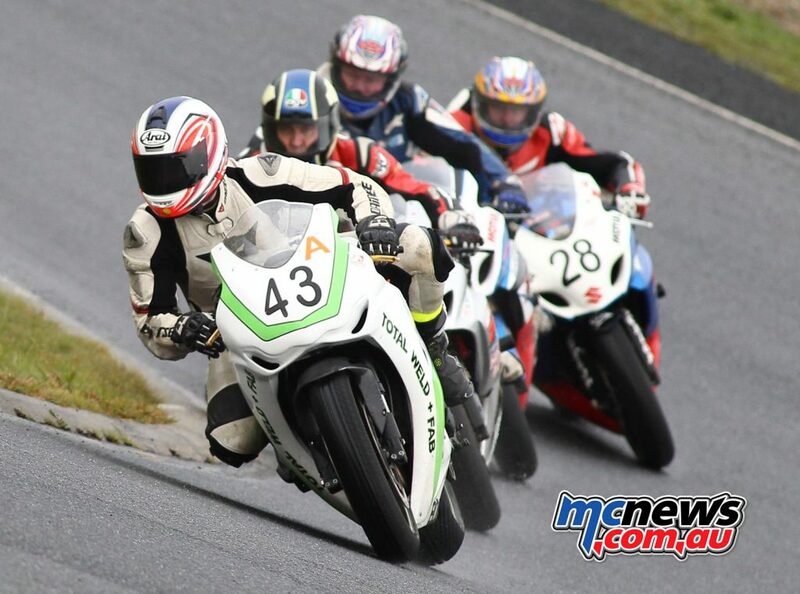 “We are currently running a five round championship, as well as being privileged to be able to run the final round of the national Australian Superbike Championship at Winton later in the year. In addition to those 6 meetings, we are also running a seniors meeting at Broadford on the 10th & 11th of September, which is a meeting open to members of all clubs. “As a club we see that developing the juniors must be an integral part of our plan to continue to grow club numbers over time and to foster and invest in the young talent which is currently entering into road racing. Riders such as Ted Collins, Nic Liminton and Ben Blyth are all products of our junior road racing development program. As well as riders such as Levi Day who is now racing overseas. Another path we have taken to bolster numbers and encourage participation is our 1st timers program for rider new to racing. 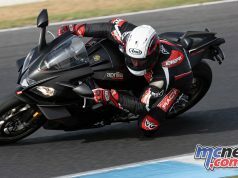 It is a great way to move from either road riding or track days. It includes an assistance briefing prior to their first road race meeting, which covers all the basics from bike preparation, the gear needed, processes, fitness, sustenance and travel. As well a seperate warm up session is run on the day to ensure their first sojourn onto the track is a little easier, without the fast A graders screaming past. Trevor Manly is our coach and he also runs on track mentoring for first timers during these warm up sessions, as well as assistance with set up and suspension. Every Friday practice at out race meetings are also run as coaching days, with the new riders having access to not only our coaching team, but also to the other faster club members. This guidance continues throughout the weekend, so that the newcomers have someone they can feel confident in asking questions of and gaining assistance when needed. The Thunderbikes is always a fantastic category to watch and more so to listen to. The thundering V-twins standing the hairs on the back of your neck when at full noise down the main straight. Even in the wet conditions, they were at full throttle making a cacophony of sound lap after lap. Kym Grosser had an almost perfect round, which was only spoilt by Brett Harris getting the better of him in the final race on a drying track. 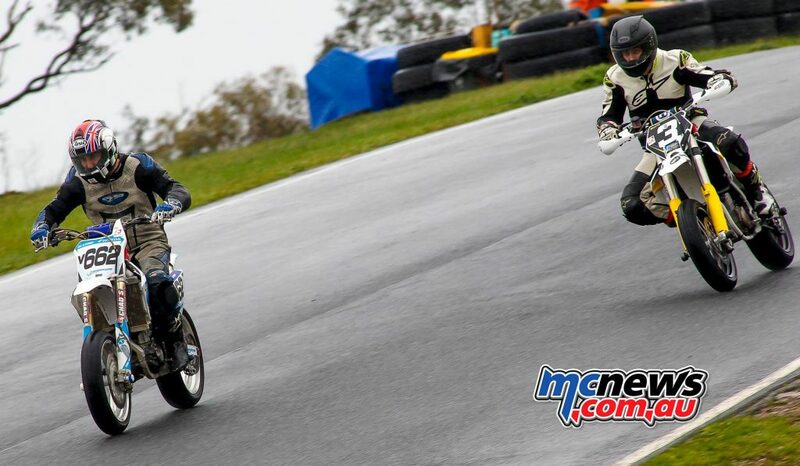 Jamie Kennett’s weekend could not have gone better except for a DNF in the 2nd race. But his consistency throughout the remainder of the weekend proved to be the determining factor in him claiming the round win. Darren O’Dowd narrowly managed to pip newcomer Karl Grouswtra for the round win on a count-back. It was unlucky for Karl, who was having the ride of his life in his first ever road race meeting. His lap times in the wet were up there with the best of the Expert riders, which bodes well for his future as a road racer. He rode the wheels off his ZX10 in the first three races and only his DNF in the final race consigned him to 2nd for the weekend. 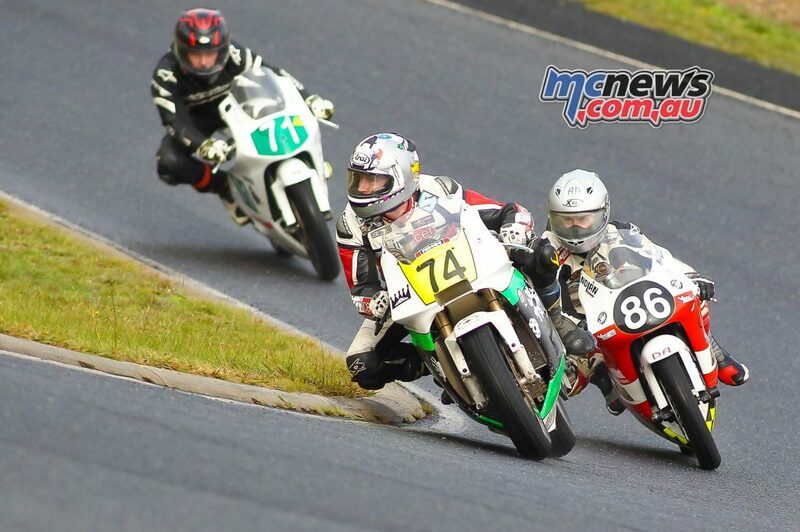 One of the elder statesman of motorcycle road racing, Andrew Ord from Ord’s Motorcycles was in great form over the weekend. He certainly didn’t have it his own way though, with both Ben Gotch and the other elder statesman Chris Ognenis (now in his 300th season of road racing) making it a tight battle to claim the spoils for the round. Although Chris managed to win 3 of the 4 races, his DNF in race 3 proved to be a points killer, landing him in 3rd for the round. Ben Gotch recovered well after his disappointing first round of the Victorian championships at Broadford earlier in the year, three 2nd places and a 4th secured him 2nd for the weekend. It was great to see him regain some consistency and get his racing mojo back. But Andrew Ord’s consistency proved too much for the others and he walked away with the silverware (well…OK…it’s club racing, so plasticware) for the round. It should also be mentioned that Ordy’s Motorcycles has been a huge help to the club this year, with them offering a Mini bike as a raffle prize as well as sponsoring many races throughout the series. Cori Bourne finished atop the points with two 2nds and two firsts for the weekend, just pipping another of the elder statesman, Brian Bezzina who I often bashed fairings with back in the 1990’s. It’s great to see Brian still out there pedalling his motorcycle movers fleet of bikes. I say fleet, as he did triple or quadruple duties over the weekend, making up half the entries for the meeting. Also great to see was Graeme Koschmann still out there and still competitive. Graeme was also doing multiple classes, proving that age does not weary them, although I’d guess he’s feeling it at his age……. Graeme finished in third place for the weekend with 4 fantastic rides. In one of the races which he won, the starting grid was sent of in two waves, Graeme being in the 2nd wave, but he still managed to catch and pass the entire field of both waves and not only win the class but also greet the chequered flag first. It was a thrill to watch him carving the entire field up in the slippery conditions. Graeme obviously feeling very confident in the wet. Always a highlight of these meetings was the Gp Juniors. These young guys and girls are so young, yet so fast! Jack Cousens had a brilliant weekend with three 3rds and a 2nd to end up on the final podium step for the weekend. But it was the two youthful protagonists of Peter Nerlich and Scott Nicholson who fought it out for the top step. Scott getting the better of Peter in every race except the 2nd, where Peter pipped Scott for the win. These three riders will no doubt be ones to watch in the future. Their composure in the slippery and changing conditions throughout the weekend belies their chronological ages. 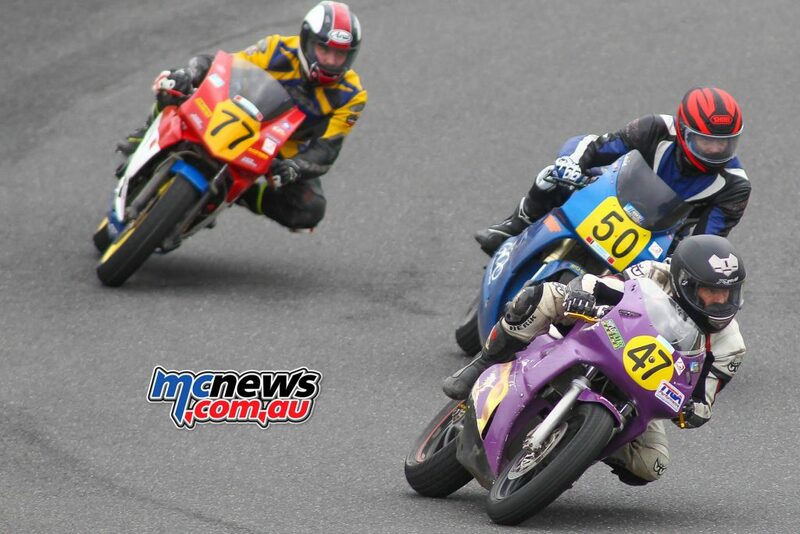 Scott also did triple duties, racing his 125GP bike and his 300 production bike as well over the weekend. The George Carrick was one of the best races to watch over the weekend, with three young racers battling hard to take away the memorial race. Dallas Skeer was unlucky not to take out the round win, but a DNF in race two dashed his chances of taking the top step and he ended the weekend in third place. 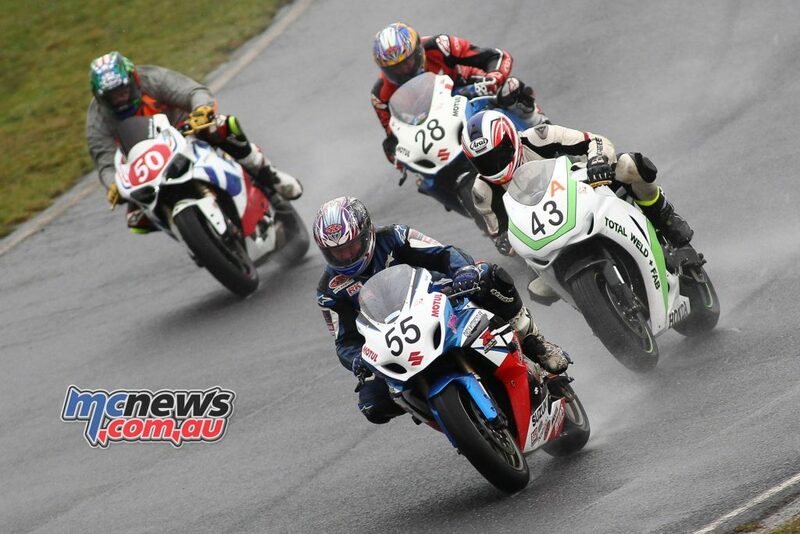 Tom Edwards proved consistency was the key to taking home points on a wet weekend of racing. Tom managed three 2nd places and a 3rd place to take 2nd. But Scott Nicholson again took the silverware with his consistency proving key to winning the round. Although only greeting the chequered flag once over the weekend, his consistent 2nd’s and 3rd’s gave him enough points to take yet another round win. 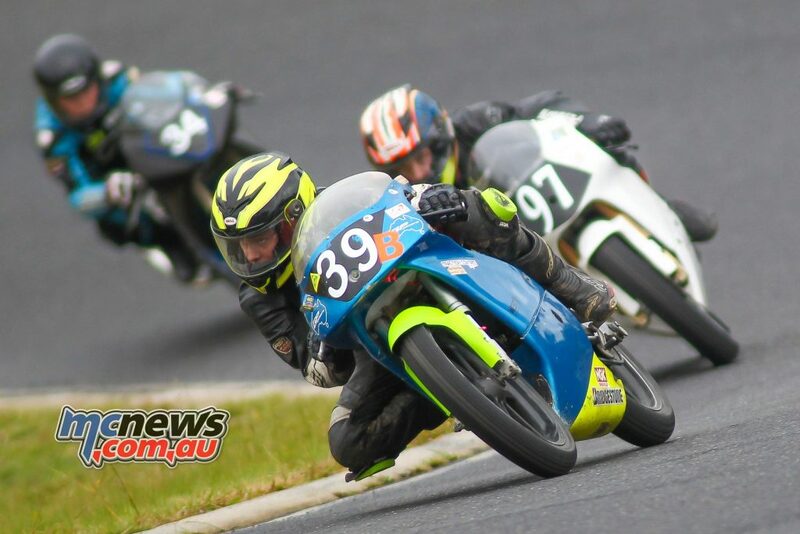 All three of these young guys were fantastic to watch and are future stars of Australian Road Racing. Scott Nicholson and Dallas Skeer kept in front of Mateo Favero all weekend to take 1st and 2nd places. Mateo’s DNF in race three costing vital points for his hopes of taking the top step. The always hotly contested Greg Bailey Memorial trophy was taken out by Ben Gotch. His Return to form showed as he took both wins in the two Greg Bailey races. Veteran Andrew Ord took two 2nd places to take 2nd for the weekend and Steve Rubinic managed three consistent 3rds to round out the podium. 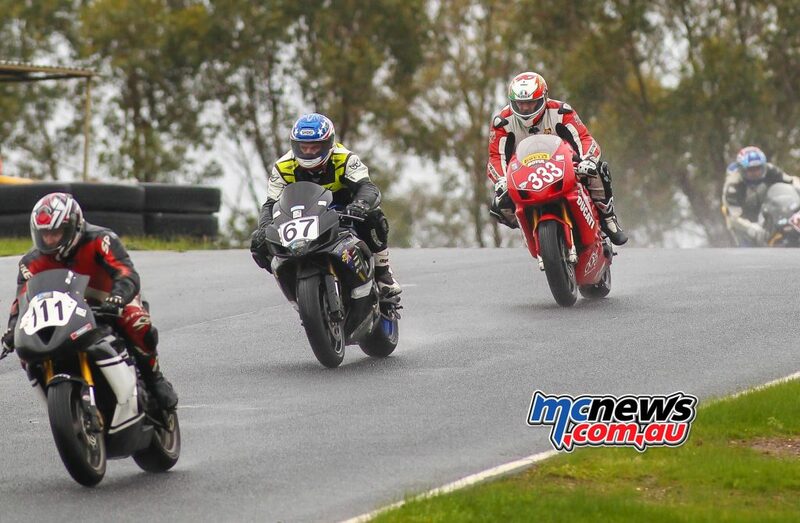 Jason Embley was unbeatable in the wet with a perfect record in the 400 class. Brian Bezzina took the 2nd step in all four races to take 2nd overall and Stephen Brocklesby only blotted his copy book with a DNF in the first race on Saturday to round out the final spot and take 3rd for the weekend. Jamie Kennet was also another with a perfect record over the weekend in the novice class, showing he’s no novice. He took 4 wins in the 4 races to end up with a perfect 100 points for the weekend, beating Luke Jones and Ben Mitchell for the round win. In the 600 Expert class Clint Farr races, the old dog Brian Bezzina took 3 race wins and a 2nd place to win the weekend. Brendan Wilson after a very shaky start to the weekend and a crash on the sighting lap on Saturday, regained his Irish mojo and took 2nd place for the round and Shane Maggs had mixed fortunes. 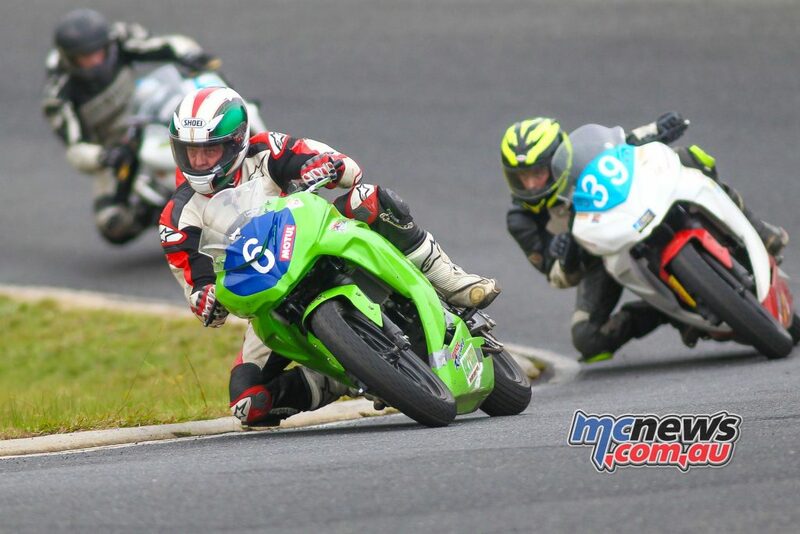 Although always fast, Shane DNF’d the final race on Sunday and ended his chances of taking the win from Brian. If he had managed to win the final race, he would have won on countback, so it must have been frustrating for Shane to see the overall win for the weekend slip away from him at the 11th hour. 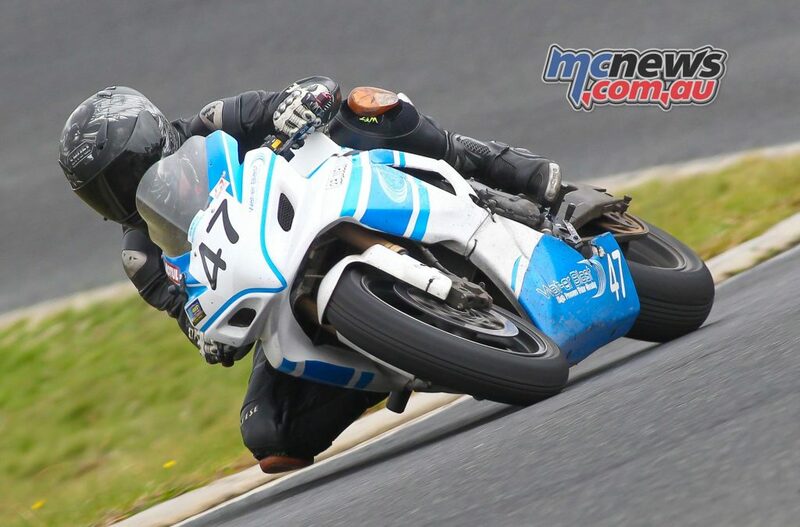 Brendan Wilson was also delighted to let me know that he is joining the ranks of the Ryan Taylor Racing (RTR Moto Obsession) team for the rest of the year. This will be a huge help to the talented Wilson in terms of set up and coaching and an asset to RTR with another very fast and consistent rider. We wish Brendan well for the remainder of his season and look forward to seeing some huge gains. No excuses now mate! 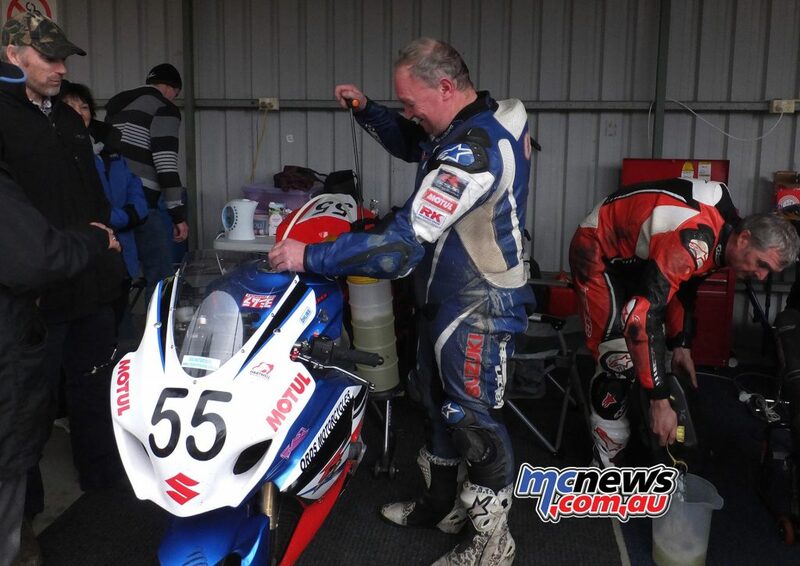 Scott Nicholson racing in three classes for the weekend was almost flawless in each of the four races, only gifting veteran Graeme Koschmann a win in race 3. Which was a sympathy gift for Graeme I think. Bryce Ognenis is keeping the Ognenis name intact and he finished 3rd for the weekend with three thirds and a 2nd place for the weekend.